Shared by Alan at Loch Na Mhoid Community Garden in Black Isle on day 8 of the Culture Kitchen Relay. Serves 4. 1. Combine flour, salt, egg yolk, 1 tsp oil and beer together. Beat to a smooth batter. 7. 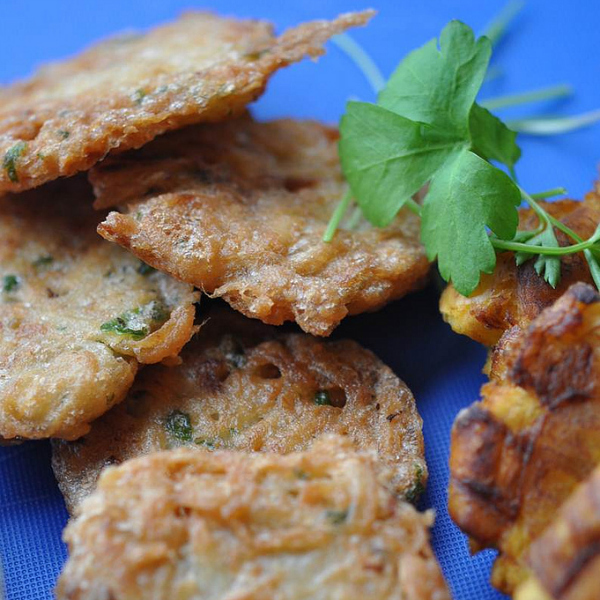 Remove fritters with a slotted spoon and let them drain on paper towels. It’s a lovely autumn day today. The colours in the The Hidden Gardens are changing. Our administrator was out taking some pictures today, as the golds and reds in the Gardens look like the gold of the Gurdwara dome and the red brick of Tramway. 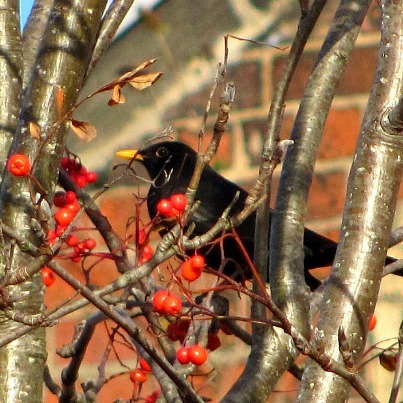 In one of the pictures there’s a visitor to the Gardens, who was chomping on some of the berries. Have you seen him? 1. Very roughly mix together flour, salt and butter using a fork. Does not have to be well mixed. 2. Add water and draw together. Turn out on to a well floured surface. 3. Roll out to 1 cm thickness, fold over in thirds. Roll again and repeat approx. 6 times. The dough will be very rough at first with lumps of the butter so don’t worry, it will become smoother. 4. Wrap in clingfilm and rest in the fridge for 2 hours (while it’s in the fridge you can get on with the filling for the pie, see below). Roll and fold again 3-4 times. Divide in two, roll out one piece to line dish and other piece for top of pie. 1. Finely chop and sauté onion in butter until soft, add garlic and oregano and sauté for another minute or two, then cool. 3. Mix together the cheeses, salt and pepper. 4. Peel potatoes, chop into cubes and boil until just cooked, then cool. 5. Beat egg. Gently fold together all the ingredients in a bowl. Only add cream if necessary to moisten. 6. Line pie dish with half the pastry and add filling, then gather up the sides of the pastry. Put pastry circle on top. Glaze with a little cream or milk. 7. Bake in preheated oven 180°C for 40 mins.